Update 12/11/13: the NP 101 onramp at Wendy Drive now is expected to open tomorrow, December 12th, after Caltrans programs the traffic controller sometime tomorrow morning! 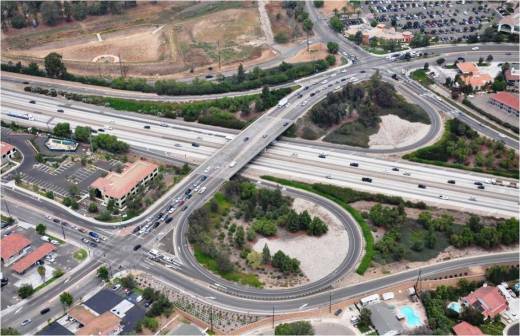 Update 11/26/13: According to the City of Thousand Oaks, the northbound 101 onramp at Wendy Drive now is anticipated to open on Monday, December 16th due to other requirements from Caltrans and the completion date for the entire project is by the end of December. Update 9/19/13: In May 2013, the City entered into a reimbursement agreement with the Seventh Day Adventist Church to construct intersection improvements at Academy Drive and the 101 Freeway. These improvements are being added to the existing project and will elongate the project period. Doing the improvements now as part of the existing project will take advantage of the equipment and contractor that is already mobilized and will reduce further inconvenience to motorists in the future. The project is now 70% complete and is anticipated to be done by November to mid-December. 90% of the bridge's pavement is complete. Remaining items to be completed include traffic signal installations/modifications (estimated completion date 10/20/13), drainage improvements on the NB 101 onramp, asphalt overlays for the offramps, as well as street lights, fencing and landscaping to be finished at the end of the project. Total cost with the additional improvements is $15.8M, including $10.8M in Federal Highway Grants, $2.1M in gas taxes and $2.9M in developer fees (including $1.4M from the Seventh Day Adventist Church, as approved by City Council on May 28, 2013). the $1.4M will be paid once the site, once considered by Costco as a site, is developed. Update 2/5/12 from the City of T.O. Website: Construction period Feb 2012 to Aug 2013. Total cost $14.3 million ($10.9 million Federal funds, $2.1 million gas tax, $1.3 million developer fees. Construction crews begin mobilization February 13th. "The City plans to improve the Wendy Drive/101 Freeway overcrossing by adding a travel lane in each direction, widening the northbound on-ramp and southbound off-ramp, and adding bike lanes and signal modifications for enhanced public safety. Periodic night-time full freeway closures will occur. During these closures, motorists will be directed towards the on/off ramps to exit and re-enter the freeway. In addition, the freeway on/off ramps will be intermittently shut-down between 10:00 PM and 6:00 AM, and re-opened between 6:00 AM to 10:00 PM daily." Update 1/31/12: Initial work is slated to start now in the mid-February range but will not have a significant impact on traffic according to the City. The City is awaiting detailed plan updates. Click here to see updates on the City of T.O. website and to sign up for email updates directly from the City. Beginning in January the City of Thousand Oaks is widening the Wendy Drive/101 Freeway overcrossing by adding a travel lane in each direction, northbound on-ramp and southbound off-ramp, and adding bike lanes and signal modifications. The goal of the project is to mitigate traffic congestion in the area (I can vouch for that problem...). The project starts sometime next month. The project plan on the city website indicates January 30th but I thought I saw a sign showing mid-month closure. Whatever the actual start date is, expect delays and detours over the next 18 (ugghh!!) months! Final striping of the new lanes are currently anticipated for the week of July 15, 2013. But of course actual dates may vary. This area already gets mighty congested during the morning/evening rush hours, so be prepared. Try getting on/off the 101 at Borchard/Rancho Conejo. There are detour maps on the city website at www.toaks.org/wendy101 but frankly I'm having a hard time deciphering them. Regardless, I certainly will be avoiding that area as much as possible during construction.